Is the cutter and the blades stainless steel ? BEST ANSWER: The product description says the blades are stainless steel, but they are magnetic, so I don't think they really are stainless. However, this is the best foil cutter I have ever used. With the six blades, usually only takes a half turn to cut the foil. We've opened hundreds of bottles and it still works great. This is a sturdy product. I totally agree that these are poorly constructed. I have used box cutters to a most simplified style of the cutter you are asking about and both have worked with no problems. I think so, but I purchased it for a gift last Xmas and don't recall the specifics. what is the material? trying to avoid the usually disappointment with metallic-covered plastics, and really trying to avoid plastics altogether. Thank you. BEST ANSWER: I have gone through many of this foil cutters, The work fine for maybe a month and then they fail. The problem is the combination of mental and plastic is never a good design it is only as strong as the weakest point, in this case the plastic connection. I wish someone would design a foil cutter entirely out of metal components. I know it would be more expensive, but I would gladly pay the price. This foil cutter has stainless steel blades. After using at least three other foil cutters, all of which worked poorly, I thought this one would be different. 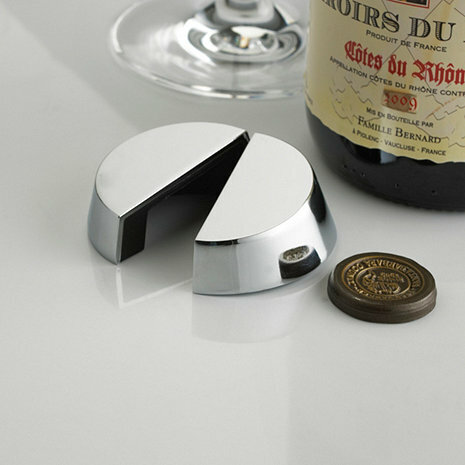 I was impressed with its design and the Wine Enthusiast's endorsement. Alas, it fell apart the second time I used it. Managed to put it back together. It broke again a week later, and now I can't get it back together. I'll be figuring out how to send it back. And NOW where do I find one that actually works? Any recommendations? Performs very well, as expected. The weight makes for a firm feel and the 6 blades cut evenly. Best cutter I have found. Accomodates bottles with wide collars around the cork. Very sharp blades for effortless cutting (once around usually does it). Very solid construction and relatively easy to grip and close. There are plastic versions of this cutter available for less than half the cost, but this one looks much classier. Slight ergonomic improvement in shape would get it 5 stars. I have purchased many items including several Euro Cave Wine refrigerators, Reidel glasses , corkscrews etc from Wine Enthusiast and have never had a problem with their products until I purchased these foil cutters. They both fell apart after a couple of months!! The small black cutters completely fell off the stainless steel body. ...will never purchase again! This opens everything with one twist and FAST. I dropped it a few times and the little knives popped out but I was able to put it back together. Good as new!!!! plastic is cut. I ordered 4 of them. Best wine cutter I have ever used! I highly recommend this cutter to anyone who has ever been frustrated with a bad cutter! expensive but seems like it is well worth it. The six blades are very sharp and work really well. It even handles the heavy glass bottles with ease. And it feels good in the hand--obviously high quality. (maybe my old "standard" four blade plastic cutter had just gotten old, but this six blade one is wonderful) . Best foil cutter I've ever used. Since I recently received it I can't comment on its durability. ThisDevice cuts for oil cleanly and quickly. This leaves the bottle open with nothing obstructing it. I would highly recommend this. Have tried all others, you know the ones, this is far better: multiple sharp blades, heavier than the cheap plastics ones out there. Reccomend. Love it. Makes getting the foil off of the bottle easy as pie! Simple but elegant foil cutter. Beats the others I have tried. Would recommend this device to anyone. I use this all the time for quick removal of the foil. Simply place in the palm of your hand over the bottle and a quick spin and it's off exposing the top of the cork. Attractive, feels good in the hand. Now the question is whether it will last! WHAT MORE CAN YOU SAY ABOUT A FOIL CUTTER, AND IT DOES NOT FOIL YOUR ATTEMPT TO CUT FOIL SO YOU WON'T BE FOILED. The best wine opener I have ever used! From the first time I used it all my friend wanted one. Excellent! It's the only foil cutter I've tried that works first time, every time. Best foil cutter I have ever used. This foil cutter has a good weight. I don't have to worry about breaking it like other foil cutters I have used. It makes a great gift! Love-Love-Love this foil cutter. Once around and your done. I dropped mine on the floor and it broke, so I ordered two more. I debated on buying this one and others for some time since none seem to get universally good reviews. I am very happy with this cutter. It is easy to use, feels solid in your hand and does a nice job cutting the foil with just a twist or two. Outstanding Foil Cutter! This replaced a broken plastic, very dull, 4-blade version. Comes in a handy storage case. The wine bottle foil cutter is great ! 'it's the best . I bought this for my husband. The first time he went to use it, it came apart. I called customer service and they sent out a replacement immediately. The new one works really well, no problems. EXCELLENT for cutting foil. No other cutter compares. This is the second one we have bought. The little blades fell out of the last one after about a year. Hopefully this one lasts longer. That is the only limitation or it would be 5 stars. I only used this a couple times and it fell apart...I am in the process of trying to return it. I had high hopes with the 6 blades and I am a wine server so this is important in my job duties to make wine opening quick and easy...perhaps I just received a faulty one.